As the realms of SVOD and OTT grow and develop, more and more kids’ are consuming video content on mobile devices. Once upon a time, children’s programming fell solely when children would be available to watch, and adults weren’t, but due to the emergence of kids’-only cable channels, children’s television became available throughout the day, every day of the week. The third wave of children’s TV programming comes in the form of SVOD services including Amazon and Netflix, those offering kid-centric content, providing increased choice and flexibility. Oh, and there’s still a pressing demand for children’s content; a study from Nickelodeon claims children born after 2005 consumed on average 35 hours of television per week. That’s a lot of content. According to a recent report from Ofcom, for the first time, ever, five to 15 year olds now spend more time online than they do watching TV. What’s also surprising is the fact that a preference for mobile phones over other all devices begins at the age of 11. Regarding viewing medium, the report reveals an increased hunger for time-shifting viewing among kids’, as well as a huge number of children watching TV content on tablets, smartphones, and games consoles. The world has gone mobile, and the youngsters are no exception. Another discovery that highlights just how much focus there is on SVOD content when it comes to kids, households with small kids’ watch considerably less linear TV than average, whereas homes with slightly older children watch only a little less linear TV than average. By the time children reach the 18 – 24 age group, they consume even less linear TV than households with young kids’. We are seeing similar stats in the Ampere Analysis recent report. 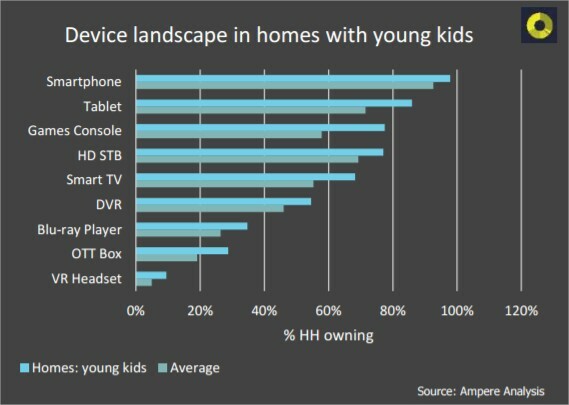 The devices listed (see chart) allow either a one-on-one video/content consumption experience (tablets, games consoles, smart phones) or devices that fall into the ‘plonk and play’ entertainment category…that is, plonk child in front, press play (Blu-ray players, OTT boxes, Smart TVs). As a vital sector of the media industry, kids’ TV distribution is something that is becoming increasingly complex. To ensure success across all junior consumer demographics, the value chain must a adopt a multi-layered approach, and in a bid to consolidate all of these efforts, there seems to be a natural drive towards direct-to-consumer or SVOD. Realising the potency and long-term benefits of kid-centric SVOD content, Disney has recently launched a device that streams 4k kids’ video content. In addition to this, Sling TV is set to launch a new on-demand channel, Sling Kids, that caters to children, or, more precisely, the parents of young children looking for easier access to kid-centric as part of their overall streaming service. And just to reiterate how important children’s SVOD content is to providers, Sony has also invested in a kids’ streaming service called Hopster, offering a range of child-friendly content to youngsters of all ages. 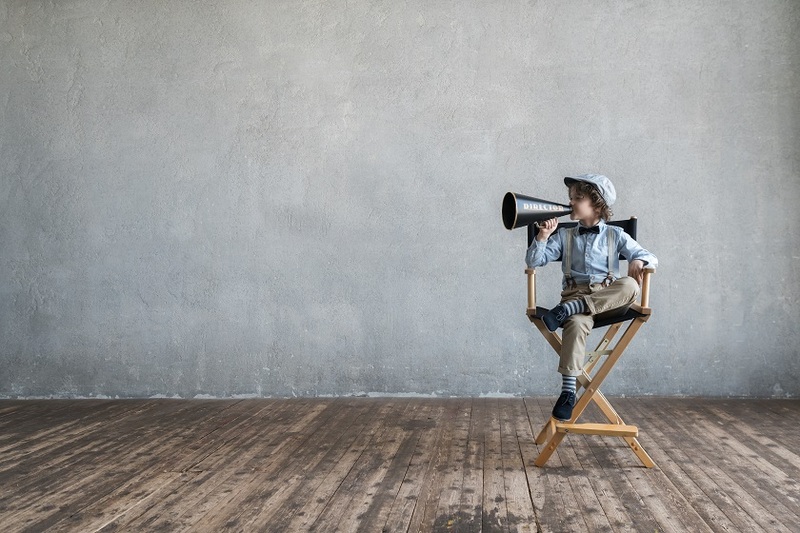 As the demand for kid-centric SVOD content grows, we feel that above industry developments are just the tip of the iceberg for 2017, and providers who find new and innovative ways to reach out to the parents of child consumers will be the ones who secure noteworthy success well into the future.